In the following review you can learn more about an anti-fungal product called Zema Cream. This product is a cream designed to treat fungal infections which typically occur on one’s feet, such as the highly uncomfortable tinea pedis (athlete’s foot), tinea crucris (jock itch) and tinea corporis (ringworm). Any of these fungal infections can result in a plethora of painful symptoms such as burning, severe itching, cracking and scaling of the skin, and irritation. If you are interested in learning more about Zema Cream’s formula, pricing, and guarantee policy, keep on reading. The inactive ingredients of Zema Cream are unknown, however the active ingredient that is used is clotrimazole. Clotrimazole has a long history of being used as an anti-fungal component. Being one of the most effective and most common of its kind, clotrimazole is present on the WHO’s list of essential ingredients, along with several other anti-fungal substances. Clotrimazole effectively blocks the production of fungal cell membranes by inhibiting one of their key components. The dosage instructions for Zema Cream are slightly different from what you might have become accustomed to in regard to anti-fungal creams. As expected, the area you wish to treat must be attentively cleaned and dried before usage. Once this step is done, proceed to apply a thin layer of Zema Cream to the infected skin, and massage it in. This way the cream can get to, and disinfect the pores. Zema Cream must be applied two to three times daily for two to four weeks, with an additional two weeks added after the infection has disappeared. If there is no sign of improvement within 2 weeks, it is suggested to talk with a doctor. Due to the composition of Zema Cream, it is possible to suffer from certain side effects if you happen to be allergic to any of the ingredients used. Strangely enough, the negative side effects of this product are very similar to the symptoms it claims to cure. If you use Zema Cream, and are allergic to it, expect to experience rashes, irritation or burning on and around the treated area. On a side note, you should keep the cream away from your face, and children younger than 2 years of age. As Zema Cream is available from various resellers, no universal price is set. When purchased from Amazon, a 10 gram tube will cost you $8.50 + $4.00 in shipping. This is ludicrously high compared to the competition. Like we mentioned before, Zema Cream can be bought from multiple sources, and the manufacturer has no control over distribution, therefore there is no universal guarantee policy in place. You will need to refer to the policy of the seller you choose to buy the product from. To make things worse, the various Amazon listings for the product are completely devoid of user reviews. 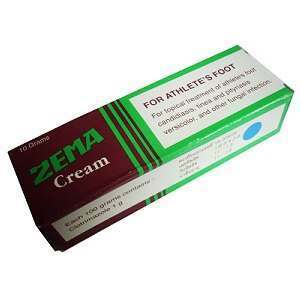 Zema Cream is an effective anti-fungal product with a strong active ingredient and convenient usage instructions. However, these positive aspects cannot save it from its high price and a lack of both a guarantee and customer reviews prevent us from being able to recommend it. Jimmy Rodriguez	reviewed Zema Cream	on June 10th	 and gave it a rating of 2.5.